Analysis by eco-lighting brands The Solar Centre has Peterborough third in the list of places with the highest fly-tipping rates, and fourth for littering. It comes a week after it was revealed fly-tipping on council land in Peterborough has doubled in the last five years with nearly 7,000 incidents last year alone, according to government figures. The Solar Centre ranked cities for the number of reports for fly-tipping incidents, and reports of rubbish, street cleaning, dog fouling and littering, by each local authority in 52 cities. The data was taken from FixMyStreet, which maps reported street problems to councils, before being adjusted for the population. Bath came top for the worst areas for both fly-tipping and littering, while Southampton also came out worse than Peterborough in both categories. London also features in the top five worst place for both. Conversely, Derry comes out top for places with the best littering rates, with Belfast residents suffering the least amount of fly-tipping per population. 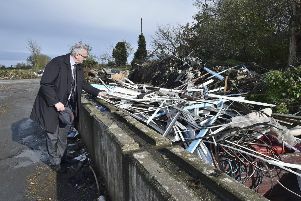 Brian Davenport, director of The Solar Centre, said: “It’s really positive to see Northern Ireland leading the way for both littering and fly-tipping, particularly with the work going on to clean up the region which saw an impressive 12 percent of transects become litter-free in 2017/18. “While Bath features at the bottom of both lists, it’s encouraging to see the area introduce litter-enforcement officers to crackdown on offenders and tackle its problem. A spokesperson for Peterborough City Council said: “Fly-tipping affects every town and city across the UK and is particularly prevalent in rural areas, so it is no surprise that Peterborough’s rates of fly-tipping are higher than many urban areas. “We take fly-tipping extremely seriously and are actively working to reduce it locally. We recently set up Task and Finish group to find new methods of tackling fly-tipping, have opened a new Household Recycling Centre and also offer bulky waste collections. “We are also using enforcement officers to target littering in our Public Space Protection Order areas where this has been identified as a particular issue. Data from The Solar Centre can be found here.